SHILOH, IL – (November 17, 2017) Veterans face a number of challenges when making the transition when retiring from military service. One of them is determining their career path. “I’ve always had that entrepreneurial spirit,” says Andrey Barshay, a 23-year veteran, and HouseMaster Home Inspections Franchise Owner. HouseMaster offers home and building inspections for residential and commercial properties and offers a 15 percent discount on their franchise fee to veterans. After serving in the armed forces for 23 years, Barshay attended an exclusive to service members “Boots2Business” class at Scott AirForce base where he was able to connect with FranNet, a business that helps connect veterans with career opportunities. 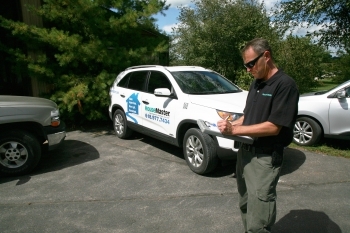 He started his home inspection business 5 years ago and now employs three additional employees. Barshay still attends the classes as an instructor and assists other veterans who are interested in starting their own businesses. “Make sure you select something that you are going to be happy with. Everybody always says; “You’re never going to work a day in your life if you enjoy what you do.” The time when you are transitioning out of the military is the time to find those options.” Barshay says. Every year, nearly a quarter-million veterans make a transition from the military to civilian life, according to the SBA. Boots to Business is an entrepreneurial education and training program offered by the U.S. Small Business Administration (SBA). The program offers everything from developing business plans to information on start-up capital. All Veterans and their spouses are eligible for this program. To learn more information about Boots to Business, email boots-to-business@sba.gov or call 202-205-VET1 (202-205-8381). HouseMaster has been providing quality home inspections for buyers, sellers, and agents since it was first founded in 1979. Over the years we have gained the reputation as the most trusted home inspection company in North America. With more than 300 franchised areas throughout the United States and Canada, HouseMaster is one of the largest home inspection companies around. Each HouseMaster franchise is an independently owned and operated business. HouseMaster is a registered trademark of HM Services, LLC. HouseMaster offers home and building inspections for residential and commercial properties and offers a 15 percent discount on their franchise fee to veterans.